hi i have got winxp professional, p-4 3 ghz, 1 gb ram and 160 gb hdd. The time it takes for your PC to become usable after starting Windows depends largely on how many items are configured to start with Windows (notwithstanding the effects of not having enough RAM, which doesn't apply to you). All these startup items have to load before the keyboard or mouse is responsive. Some of these startup items won't appear in Task Manager's 'Processes' list, nor are they all represented by an icon in the system-tray. 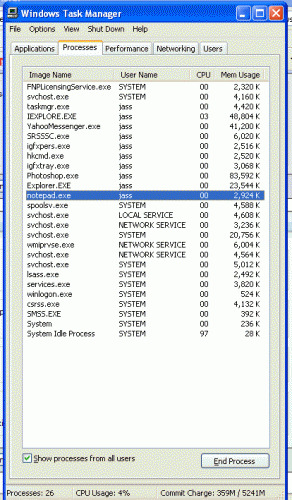 One example is the Microsoft Office module OSA9.exe. To see them all you need to run 'msconfig' Start-->Run, type msconfig, click 'OK'. They are all listed under the 'Startup' tab. By 'googling' each of them by filename you can usually glean enough info to make an informed decision as to whether it needs to start with Windows. If it doesn't, untick it's entry in 'msconfig' and reboot. a startup item. Apart from which, you'll get the msconfig "nag screen" popping up everytime you reboot after changing anything in it. is launched (ie from the user's 'Startup' folder or from a section within the Registry). Edited by pip22, 25 April 2008 - 03:01 AM.